The IdolMaster is a Japanese console game, wherein you 'the producer' working for 765 Production studio with a selection of ten possible pop idols with the aim at creating a winning pop group (correct me if I am wrong, I have never played the game as it is in Japanese). Haruka is a 16 year old who is the typical good girl clumsy heroine. She loves singing and making sweets and is easily excited (sounds a bit like me). Haruka is a positive person and works hard to make the producer happy. 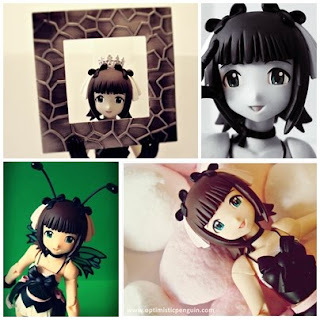 This Haruka is the Gothic Princess edition. Haruka’s sculpt nice, similar body sculpt to Miki, proportion wise. 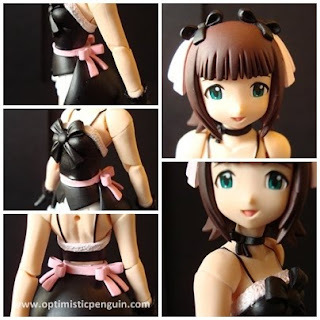 Her dress is the simplest of the IdolMaster Frauleins, and I am not a fan of the huge bustle type back skirt. Her gloves are nice, and boots same as all the IdolMaster Frauleins, her hair is particularly nice though, with a detailed fringe and lovely ribbons and bows in her hair. Nicely painted face and the little bow around her neck is very cute. Haruka has mainly block painting like Mami and Ami, her dress is just plain colours, with exception of her shiny white trim. Her face is well painted, so is her hair. Skin colour is good but there is some paint rubbing from her hair on the tops of her shoulders. Her accessories are well painted; I like the shiny paint on the tiara and the wings look wonderful, no complaints here. One thing is that she a scratch in her leg which is a shame. 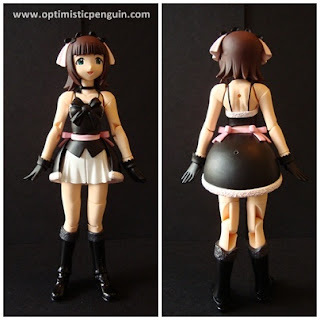 Haruka uses the E.L.F joint system, which is used by all Fraulein Revoltechs. Her hands are on Revoltech joints, which move forwards and back and rotate, her elbow is a hinge peg joint, bending and straightening, a very natural movement, she has two joints at her shoulder, a swivel joint at the top of her arm allowing her arm to rotate, and at her shoulder a Revoltech joint so she can move her shoulder forwards back, up and down, and rotate. My figures shoulder joint is a bit loose and pops off when posing her. Under her chest she has a Revoltech joint, so she can lean forwards and back and twist side to side. 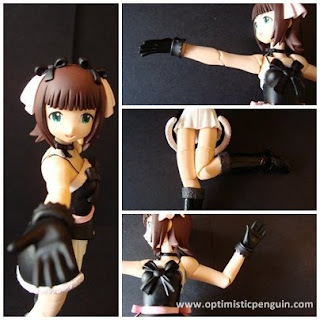 At her bottom/top of her thigh she has a Revoltech joint that moves forwards, but not backwards or side to side. Half way down her thigh she has a swivel joint so her leg can turn in and out. Her knee is a hinge joint, giving her a natural movement of knee going backwards. Lastly at her feet she has a Revoltech joint allowing her to point and flex, and can turn in and out, in and out. Her skirt does limit her from sitting down. 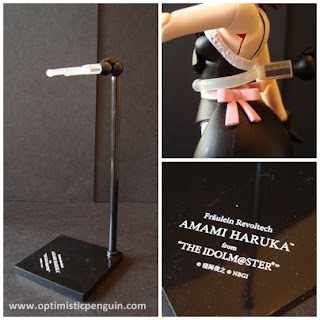 Haruka comes with the standard Fraulein Revoltech stand, which is black and has her make (Fraulein Revoltech), her name and the series she comes from written on the base. The stand itself consists of a base a pole which pegs into it, and then a two jointed Revoltech Joint, which goes in the top of the pole and then into a U shaped holder. The thing to note about the Fraulein Revoltech stands is that they are too tall for the characters, and so when in the stand their legs dangle in the air, which is rather annoying at times. 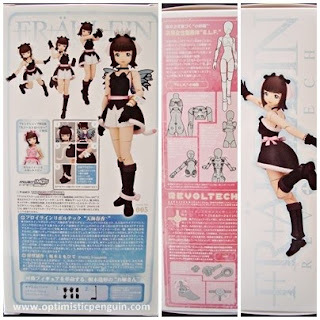 Haruka comes with the standard Fraulein box, with a window at the front, a picture of her posing on the side, on the other side details and pictures of the E.L.F joint system which the Fraulien Revoltechs use, and on the back pictures of her accessories and some of the poses she can do, and other info, on the bottom of the box all the authorized info, with her authorization stamp, and warning statements (all writing in Japanese). Inside the box she is held between two moulded pieces of plastic, with a space for her extra hands. Her other accessories and stand came in plastic bags attached to the back of her casing. This is standard packaging for the Fraulein Revoltech line. Also take note of the authorized sticker, each figure should have one. 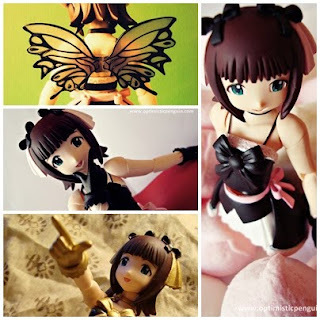 Haruka comes with a princess tiara, butterfly wings, a cat tail, a wing bracelet, and a rabbit anklelet. She also has three pairs of extra hands. 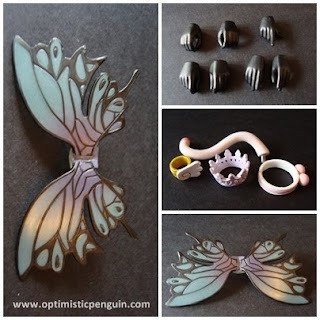 She has a small hole in her back to plug her wings into, and a small hole on her skirt for her tail to plug into. Only thing to note is unlike the newer Fraulein releases, Haruka does not come with alternative faces. Haruka is a sweet little figure, if somewhat plain, however now that I have all the IdolMaster Frauleins I have all the accessories to mix and match, and I am sure I will have a lot of fun playing with them all. Over all Haruka a good figure to have, for fans and for people like me who just wanted to collect the IdolMaster troupe, even though I have not played the game, it being in Japanese and all. Now that I have all of the IdolMaster Frauleins, I can interchange their accessories for added fun.